*I deleted about 140 lenses between August 21 and the morning of August 23, when lens editing was frozen. I had 400 lenses when I started, and now I’m down to about 260. My Greekgeek lenses transferred midway through 9/4. My other two niche accounts transferred on 9/7. 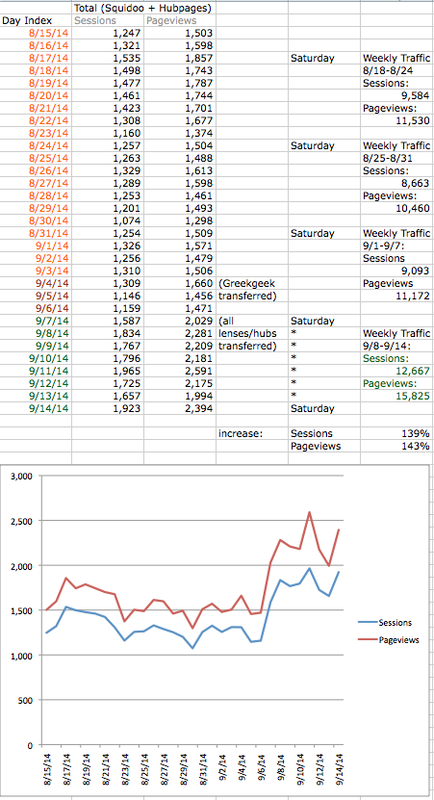 Bottom line: during their first full week on Hubpages, my transferred lenses’ traffic is up about 140%. And that is AFTER I deleted over a hundred lenses. I think the early “Opt In” lenses transferred between 9/2 and 9/8. The “Set Up Your Transfer” button is still showing on my Squidoo dashboards, so that means more lenses will continue to be moved across each day until October 1st when the remainder will be moved. Interesting to note: Prior to 8/31, Hubpages’ daily uniques were bouncing around between ~1,200,000 and 1,400,000. Squidoo’s were bouncing around between 330,000 and 370,000. Starting September 7, when I think a good chunk of lenses moved over, Hubpages’ traffic jumped up above 1,500,000, then 1,600,000 on the following days, and on September 14 it climbed above 1,800,000. In other words, the increase in Hubpages traffic is more than the daily traffic was for Squidoo, and that’s even before all of Squidoo’s content has transferred over. Which is consistent with what my own lenses show: the same articles are drawing more traffic after moving to Hubpages. Obviously, this should be true if Squidoo is suffering under a bigger domain penalty (Panda) than Hubpages is, but it’s nice to see the numbers confirming it. Again, I think it is vitally important that we convert our lenses to match the spirit of Hubpages. Let’s not be rules lawyers, trying to wear down Hubpages staff until they give in and let us make Hubpages more like Squidoo. Hubpages survived Panda — barely. Squidoo didn’t. We’ve gotta give in and do as the Romans are doing. I won’t be taking down my existing product lenses, but, for example, I didn’t try to replace the Amazon Plexo on my Airline-Approved Cat Carrier lens. Instead, I pruned out all the “visitor might like this” Amazon modules and left only the “I know this is what they want” products. I asked myself where I really, truly thought the article needed the ones I kept. On my Jackie Robinson lens, I removed the Allposters I’d used to illustrate it and searched Wikimedia, Library of Congress, and Creative Commons on Flickr to find new pictures. (In fact, I found better-quality ones). I also chucked about 5 other books I’d listed in Amazon modules for the Jackie Robinson lens and simply retained the best of the batch. On my 25 Funny Things on Google Maps lens, I removed a gazillion clickouts (I’d been linking to Google Maps because the Squidoo Google Maps module was broken), along with various links to related Amazon products and Zazzle designs. They weren’t essential. So they’re gone. In other words, I’m pruning. And I don’t intend to do any more “Top ten X” articles (e.g. my “Top Ten Mythology Books” lenses). Instead, I’ll be doing more of the Jackie Robinson variety, or — maybe — the cat carrier variety, which zeroes in on one product I’ve used and can write something about that’s more than what a visitor would learn if they read the customer reviews on Amazon itself. 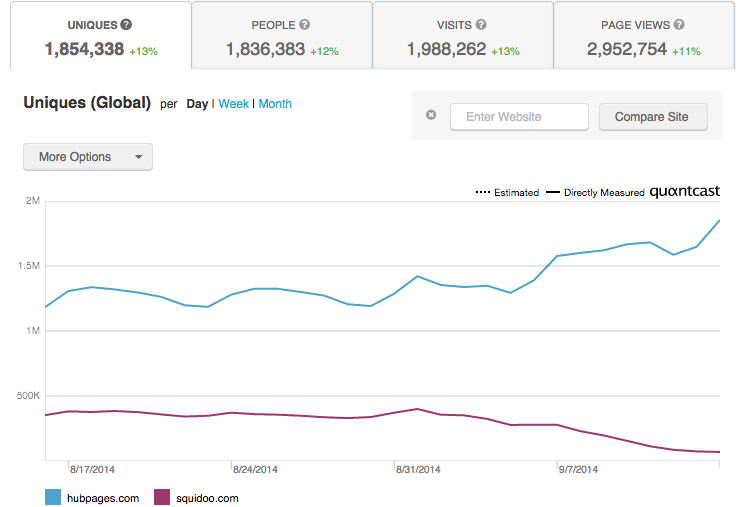 The “SQUIDOO” columns at left are data imported straight from Google Analytics. The gray “Hubpages” columns are also the raw data imported from Google Analytics. Again, back when I started on Squidoo, I used the same tracking code for all my accounts. So, in order to do a one-to-one comparison, I created the “HUBPAGES (COMBINED)” column to add up the data for the 3 transferred accounts (in gray). Orange dates = all lenses on Squidoo. Brown dates = Greekgeek lenses transferred over (to “mythphile”). Green dates = all lenses now on Hubpages. I have been “in” for 6 days now. My traffic has already double compare to my weekly traffic at squidoo and I still have 24 hours to go before it’s been a complete week. The BEST part tho is that looking at the traffic source it is mainly Google traffic, not Hub/squidoo traffic. Real stuff, real traffic. A bit of Bing too. Haven’t had much time yet to work on the squidhubs (I just moved to a new city recently and with back to school and all…) but I also do intent to prune links as well. I will also be moving some of the heavy products pages elsewhere, unless I have time to add more interesting content before the 4 months grace period is over. As for the money: it’s adding up nicely on my dashboard, but I only got 2 amazon sales (which is very very low for me)/ Clicks to my own affiliate links are way up but I need more time to see if it converts as well as it did on squidoo. Overall i am an happy camper. I just wished I could move my other hub account with this one. And it’s always nice to see your graph and charts, I have never been that good at keeping records!